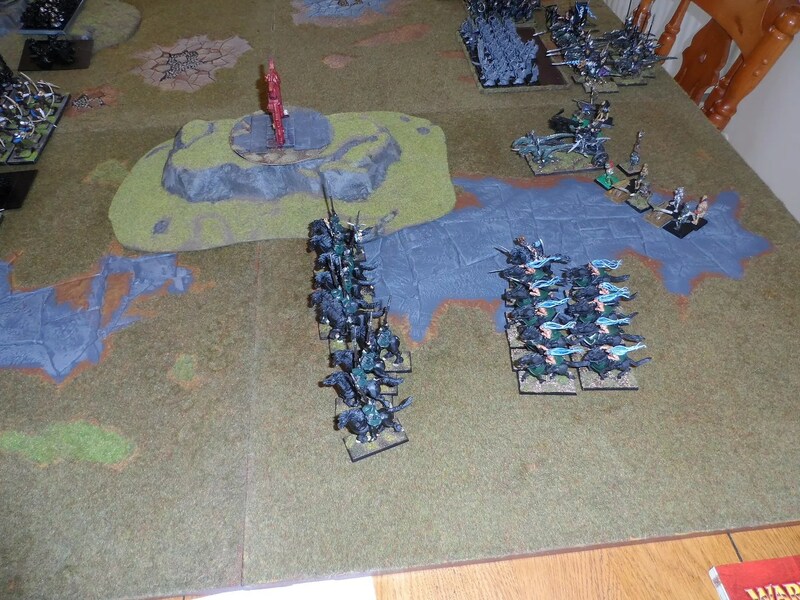 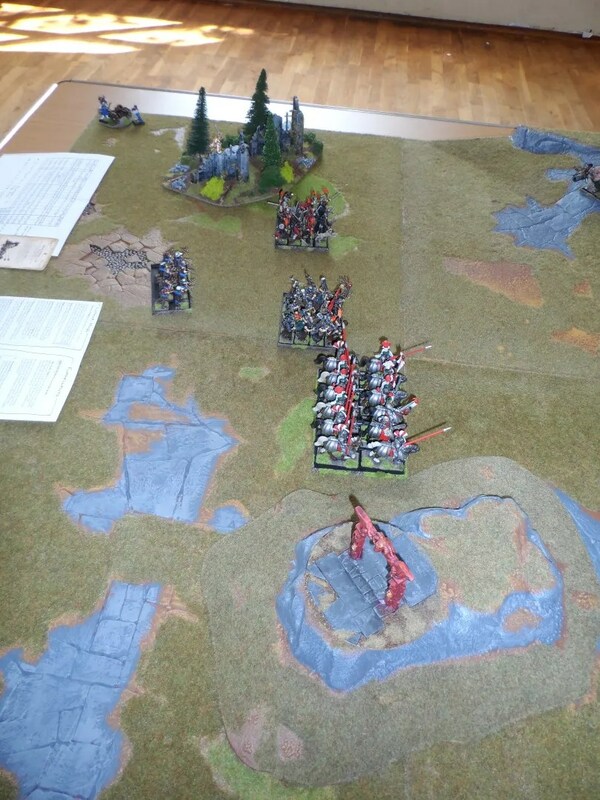 So continuing the game, I dealt with the Wolf Riders which allowed a unit of 30 Spearmen to move towards the Orcs on my right hand flank. 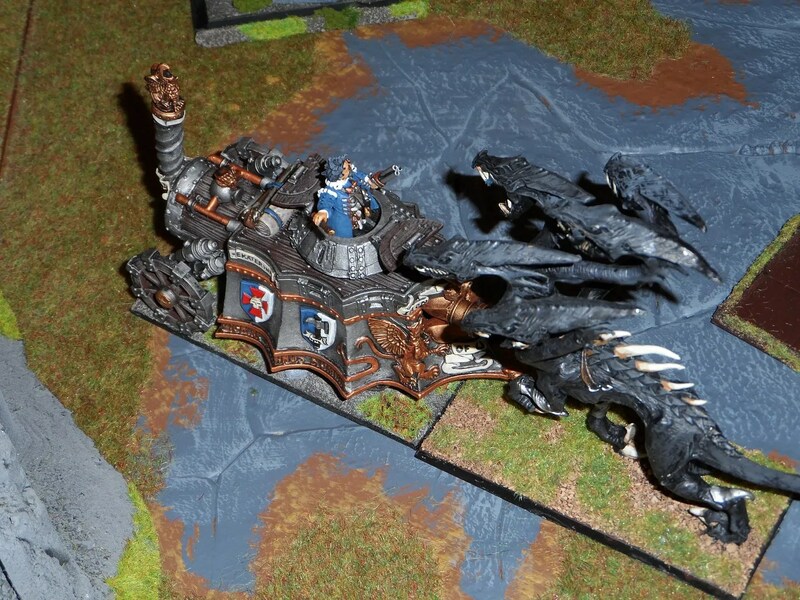 They would have the support of the Dark Riders and a mounted Sorceress. 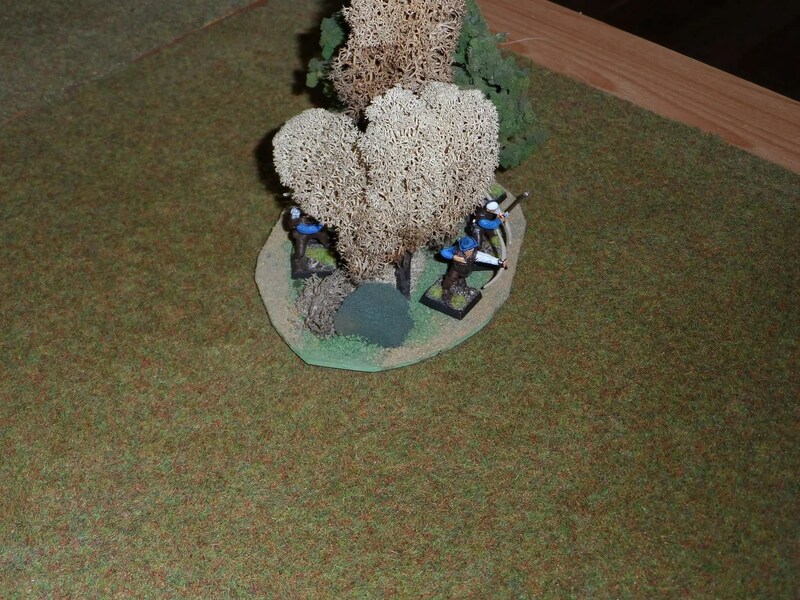 The Corsairs got a narrow escape from the Empire steam tank, as both they and the tank steamed into the centre of the battlefield. 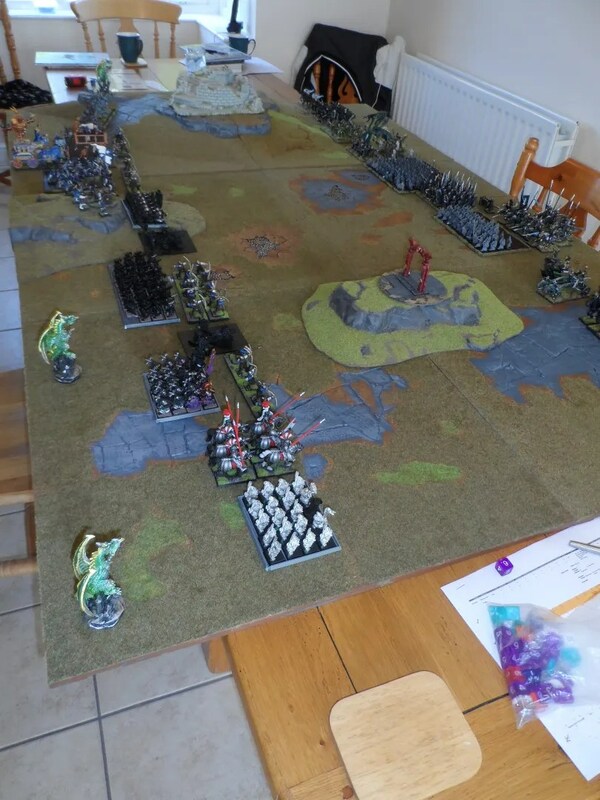 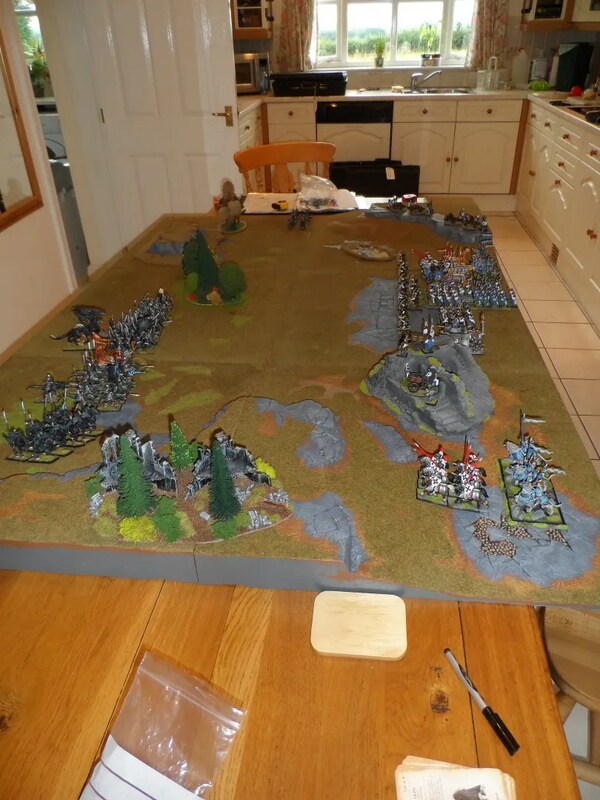 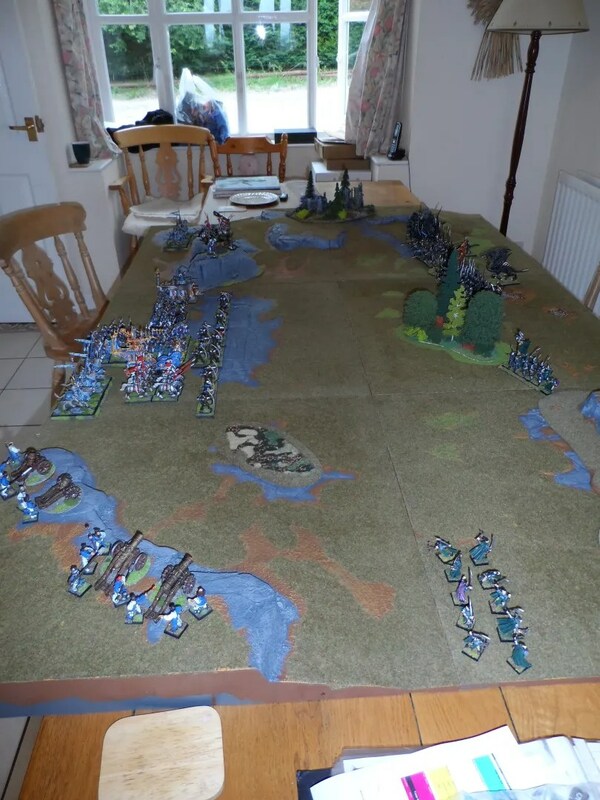 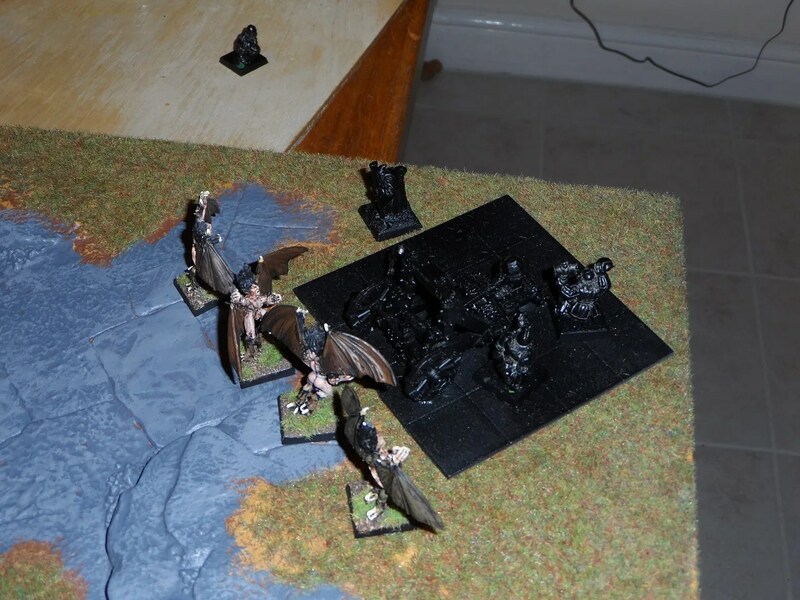 Hmm, now where do I place this mighty large template over this mighty large unit of Black Orcs ? 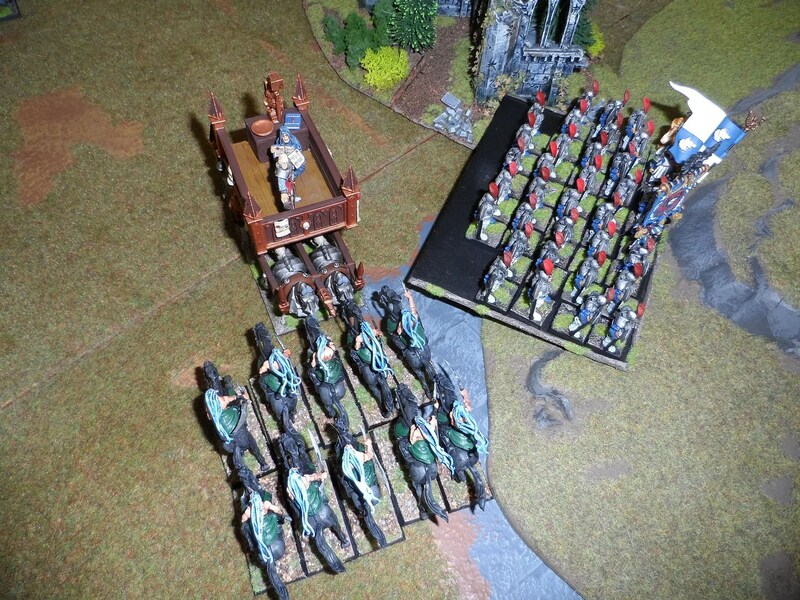 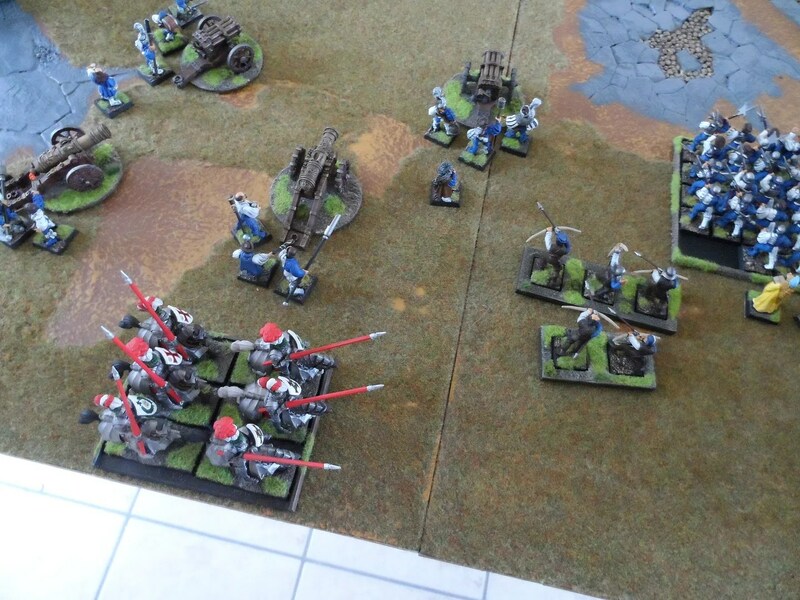 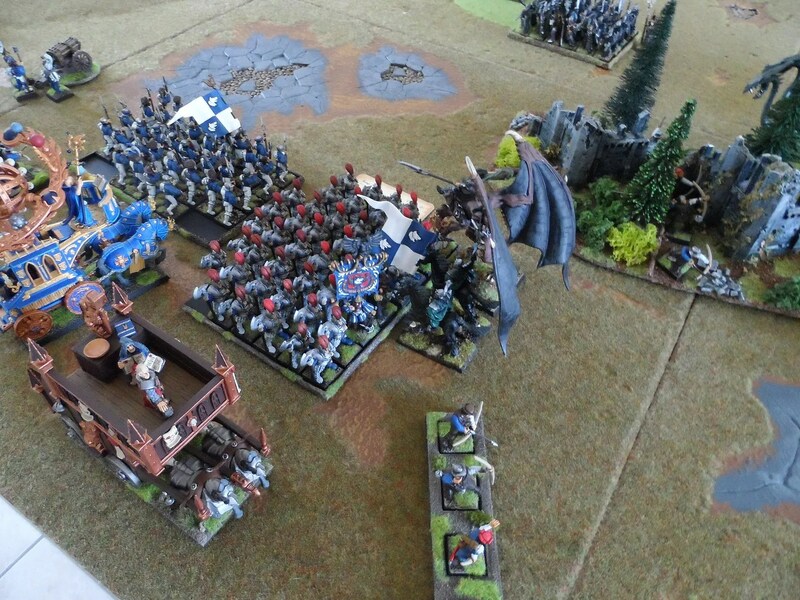 The left flank got wiped out by a unit of demi-gryph knights – 10 RXBs, and as you can see the hapless RBT crew. 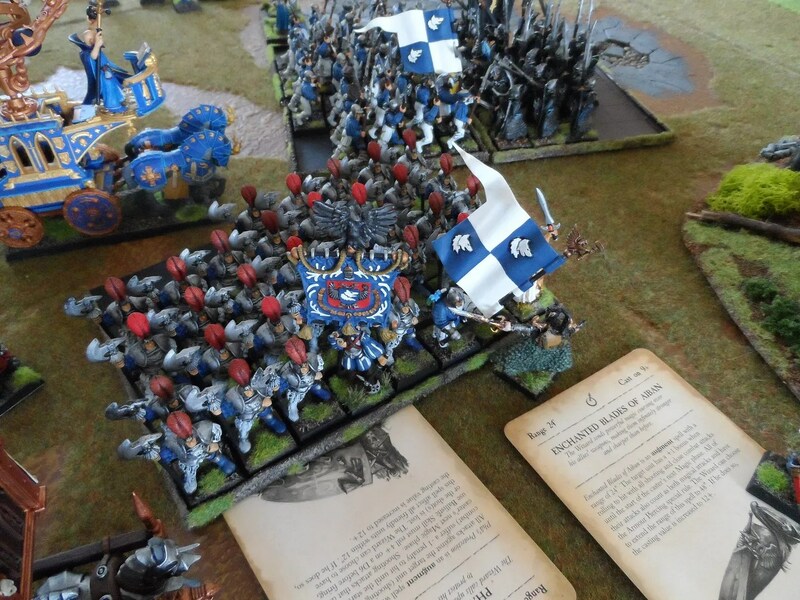 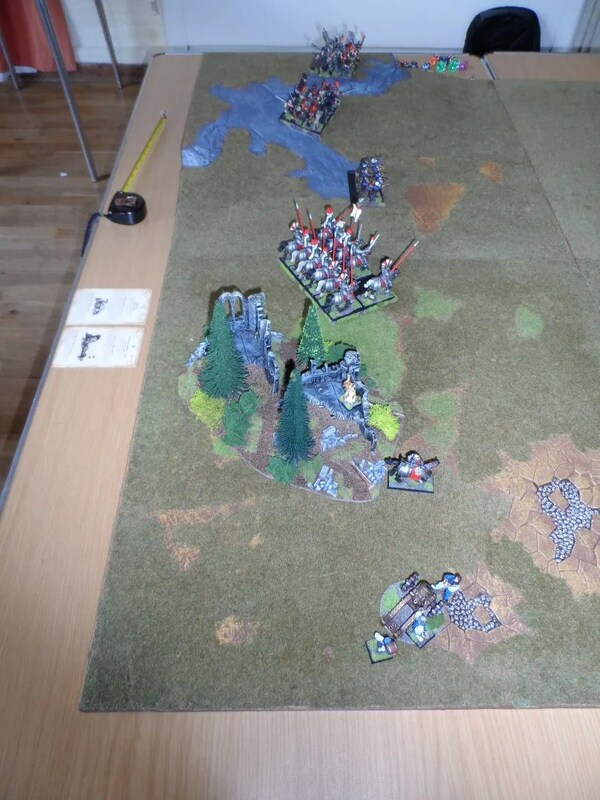 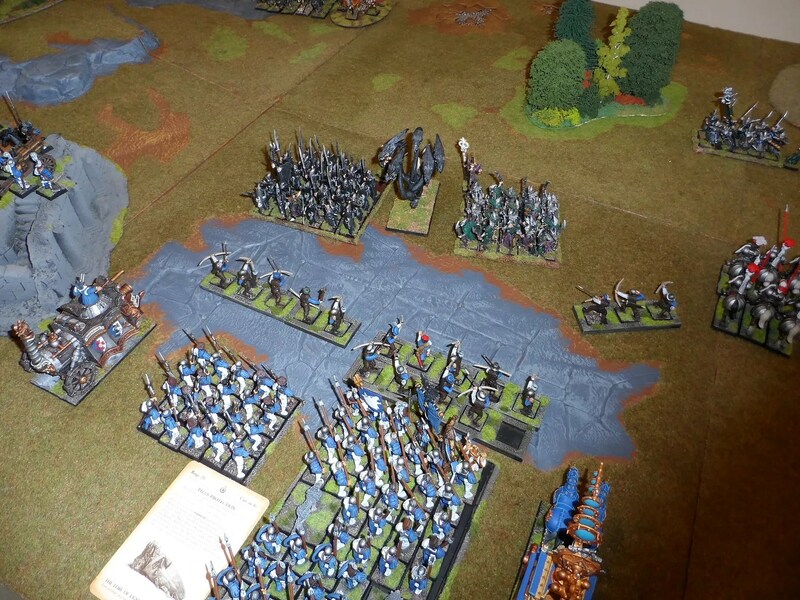 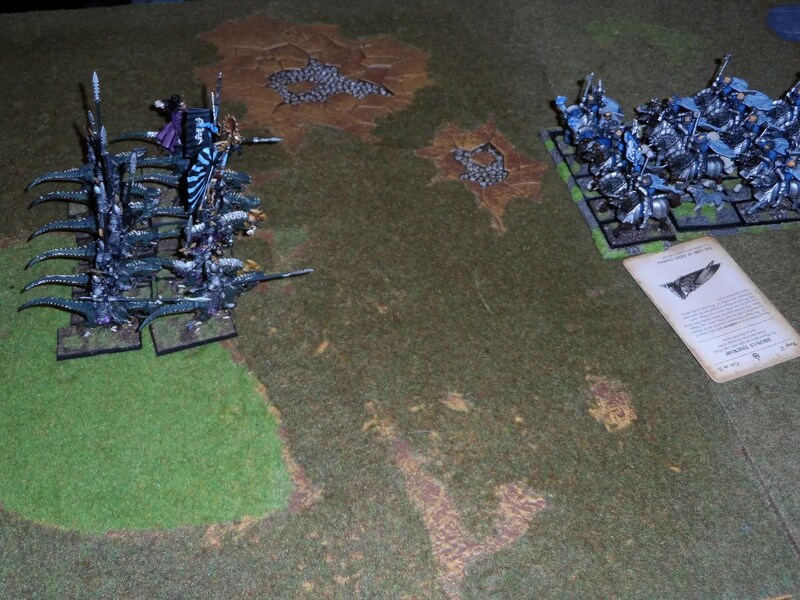 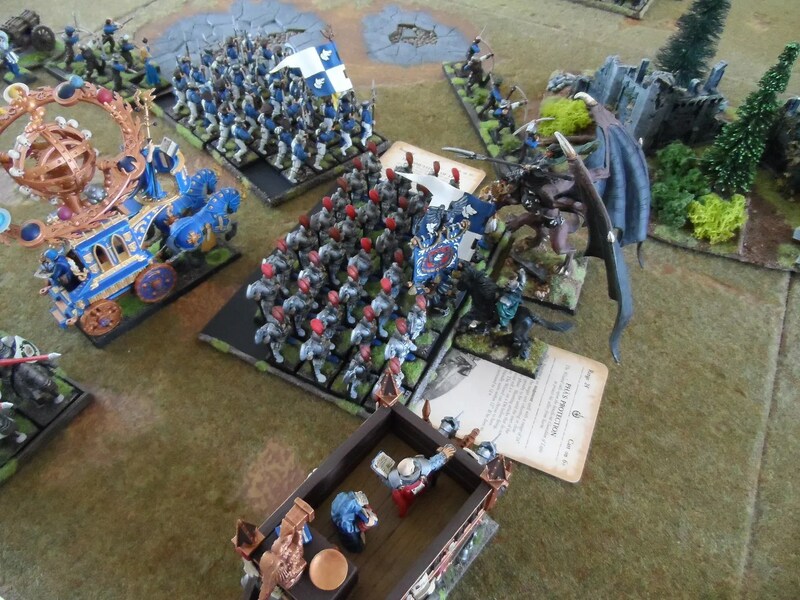 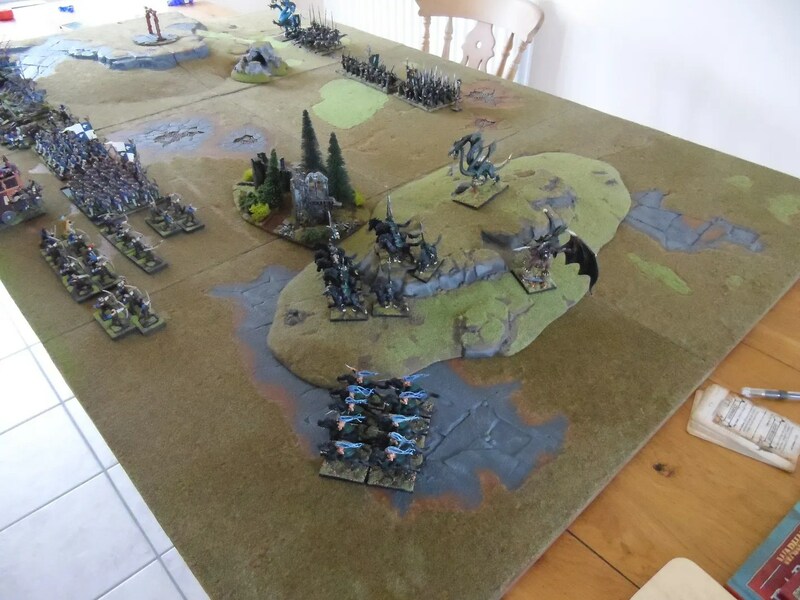 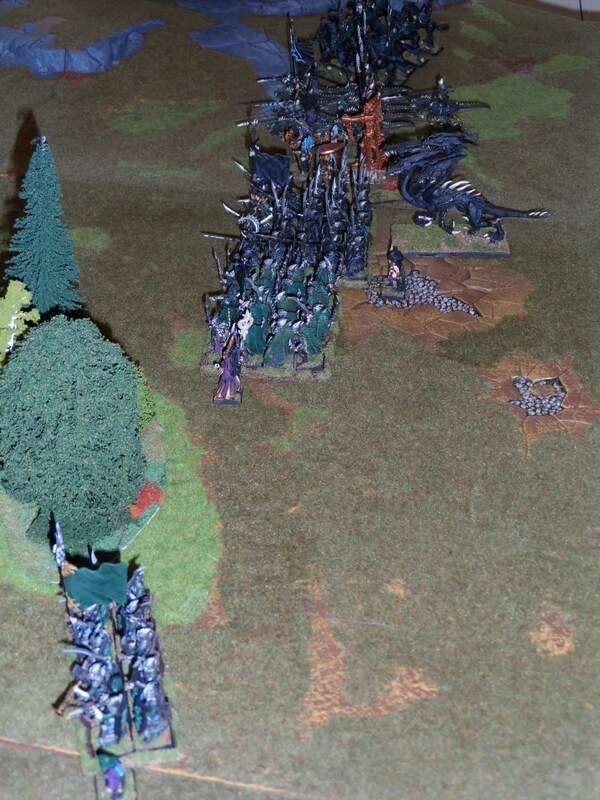 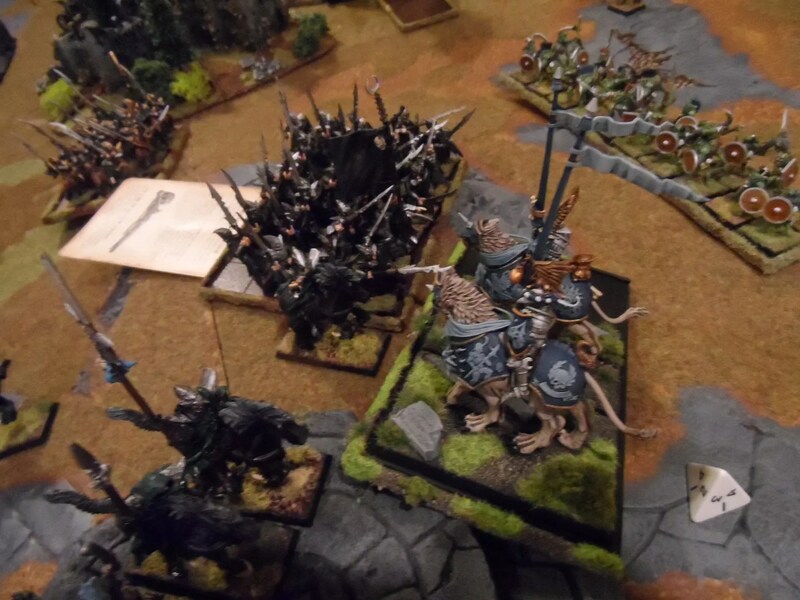 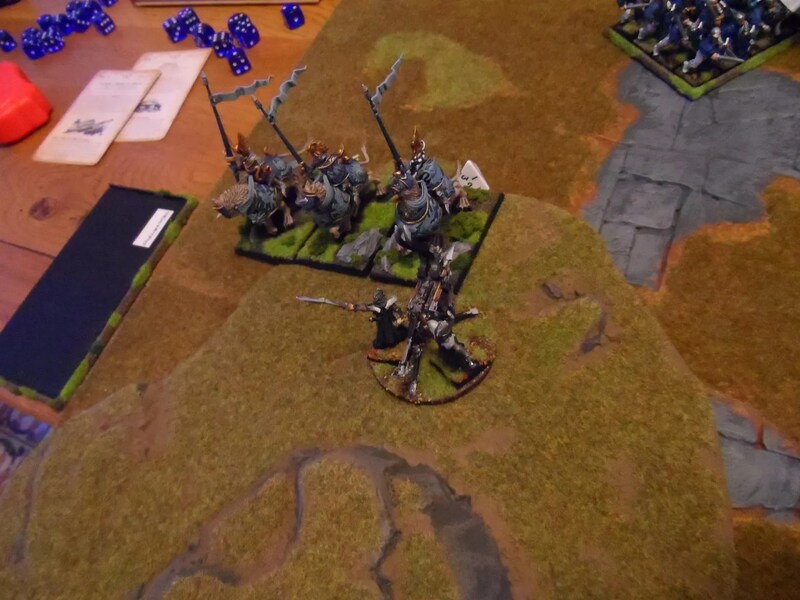 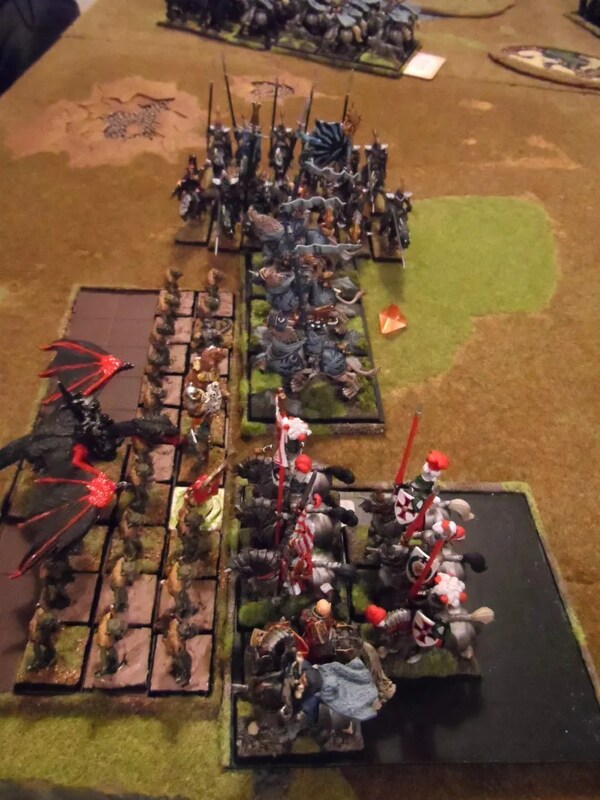 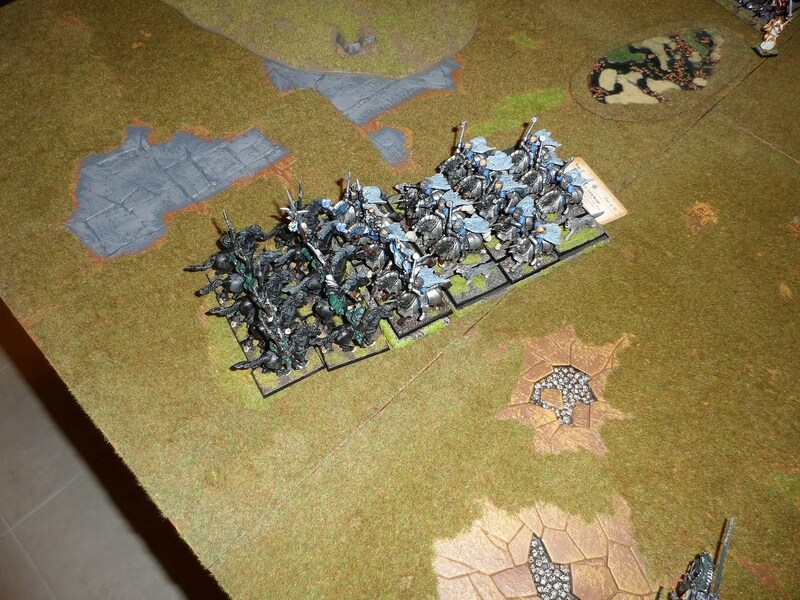 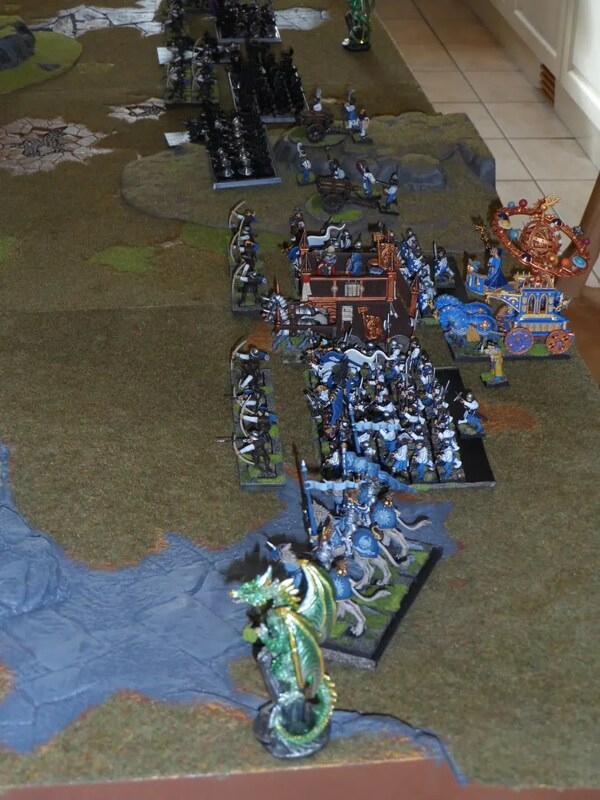 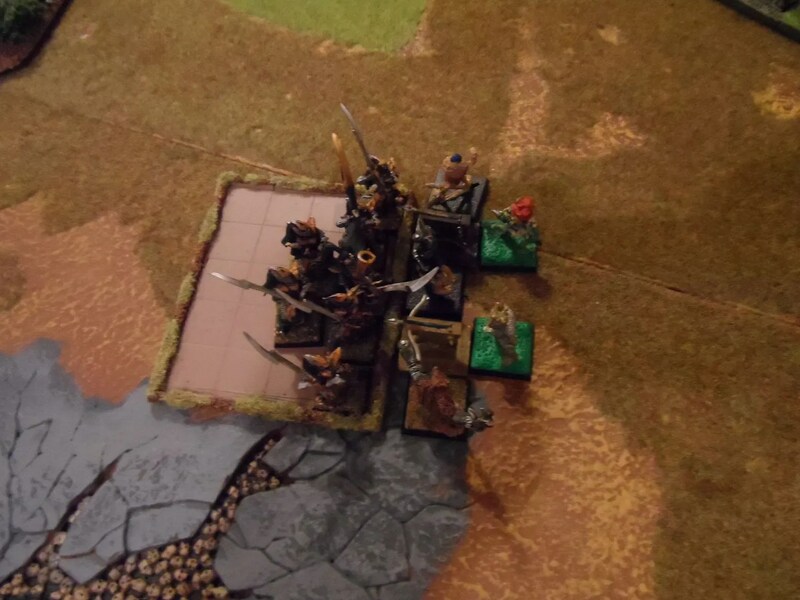 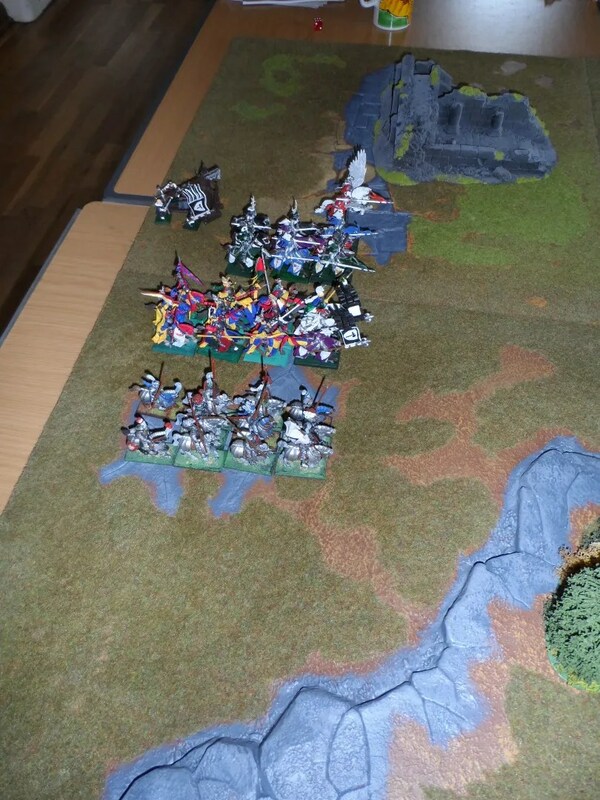 Back on my right flank, the spearmen and Dark Riders clashed with another unit of demi-gryph knights…these guys are surprisingly tough as they come packing a lot of armour. 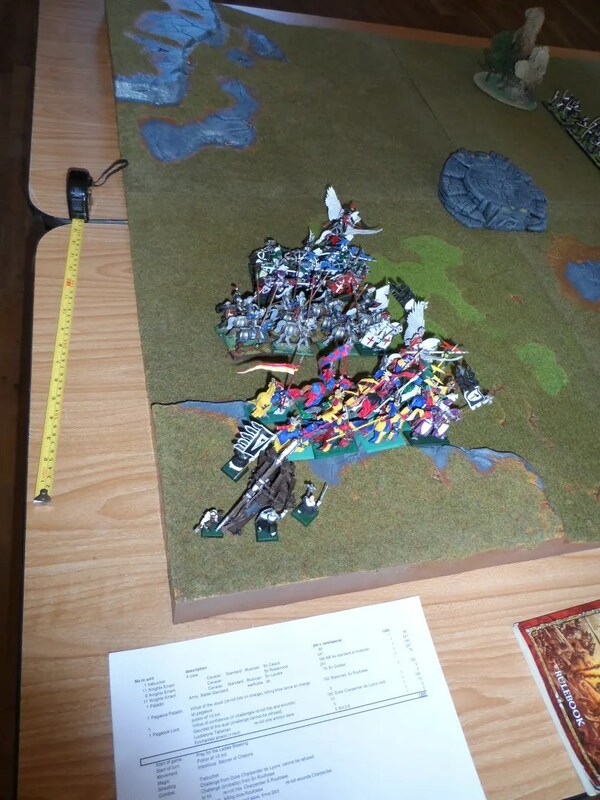 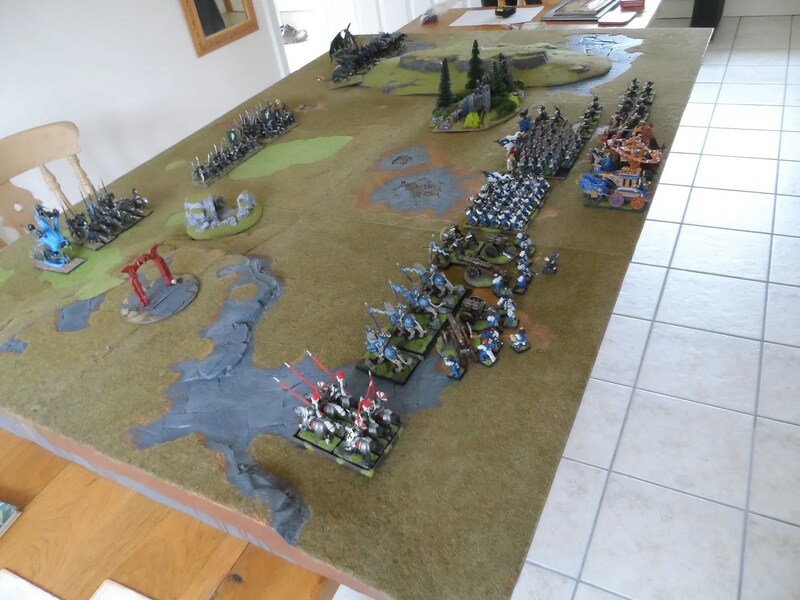 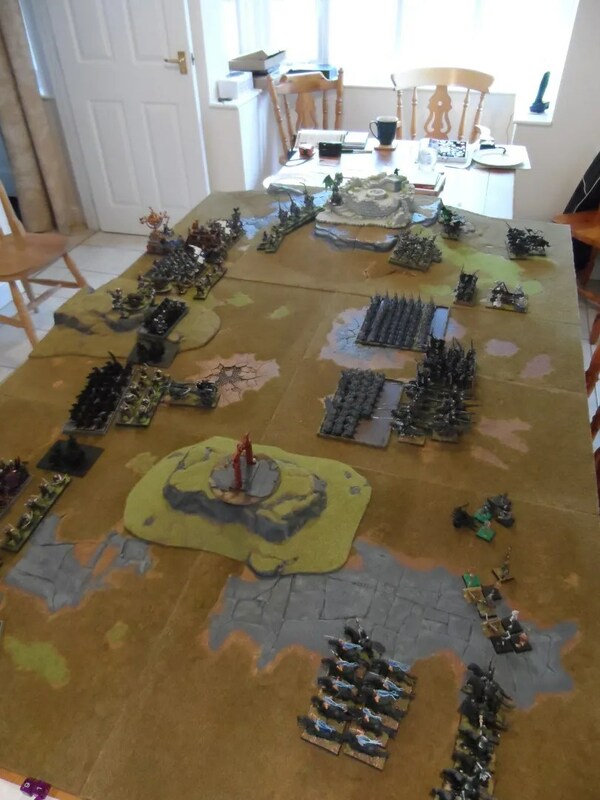 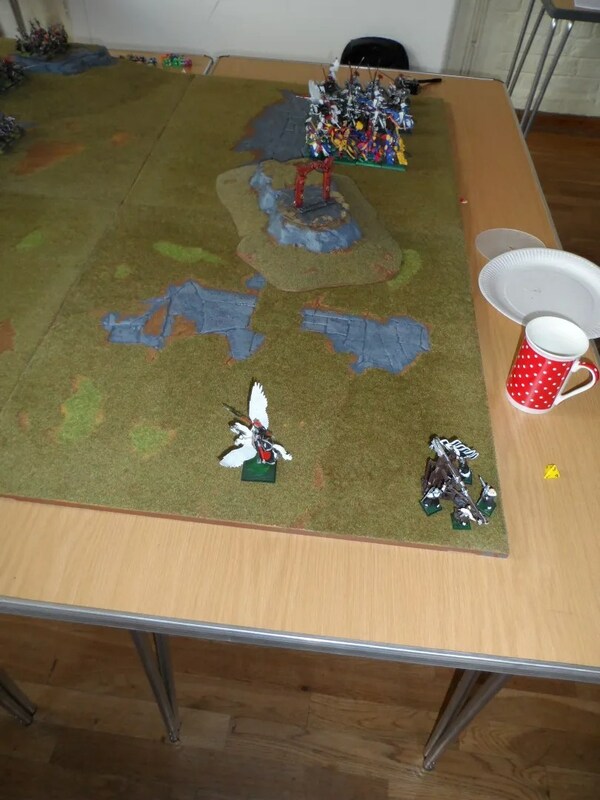 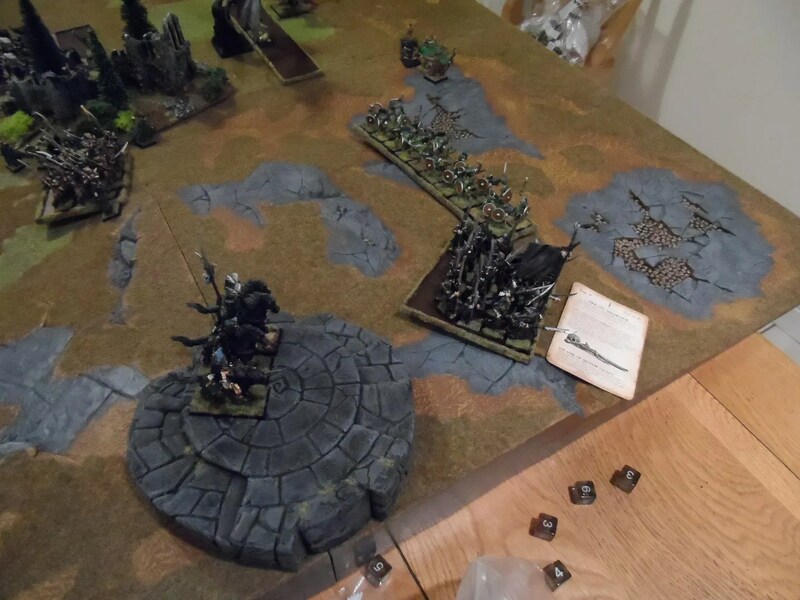 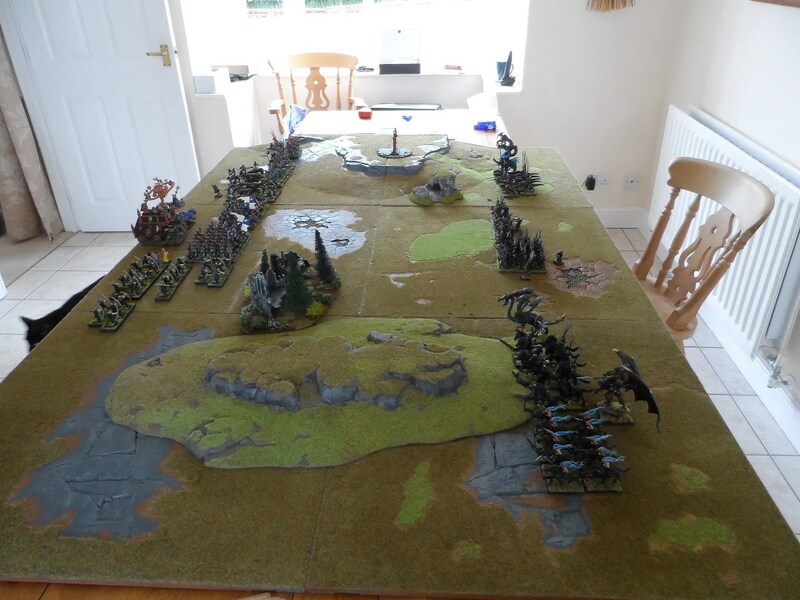 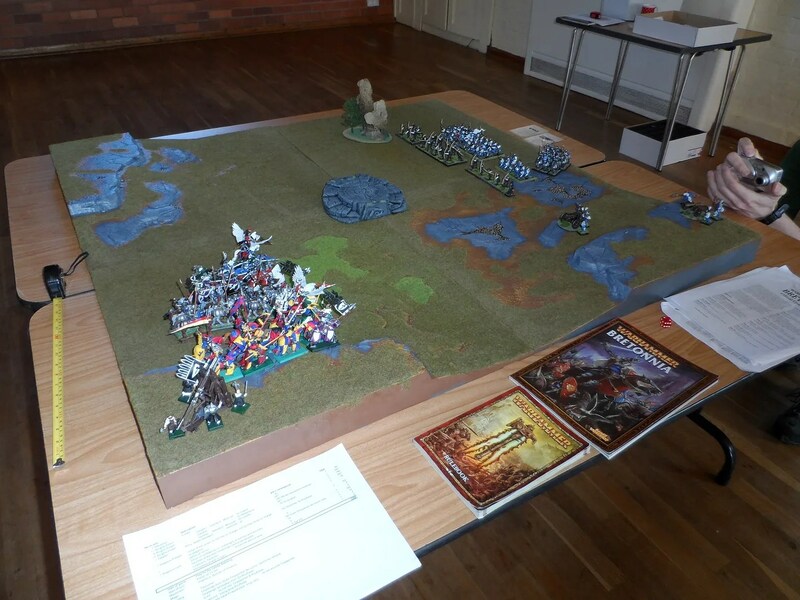 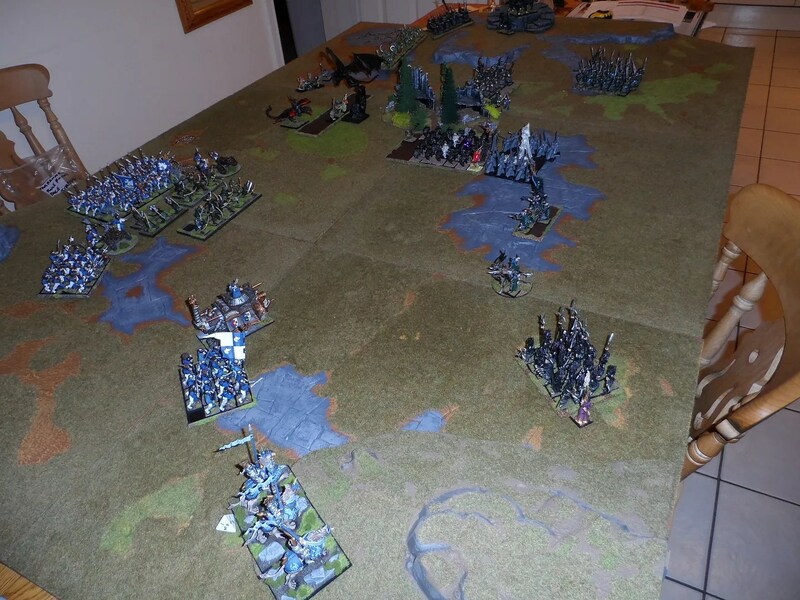 In the centre of the table, the Black Orcs (Eeza Ugezod’s) pushed forward and were met with the new Cauldron of Blood and new swordsmen. 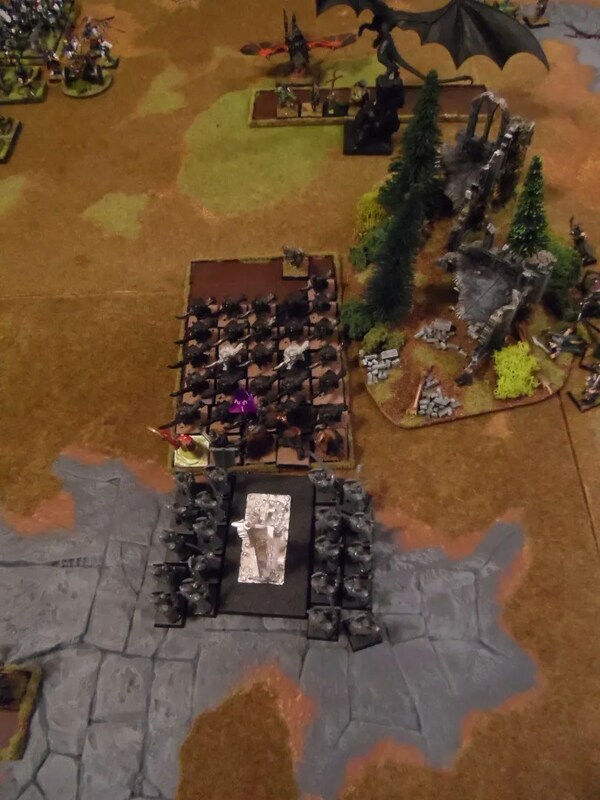 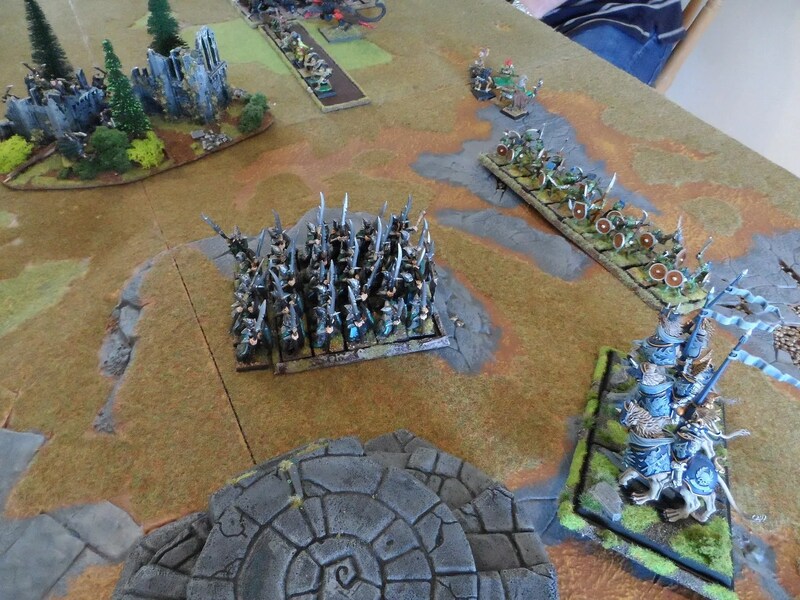 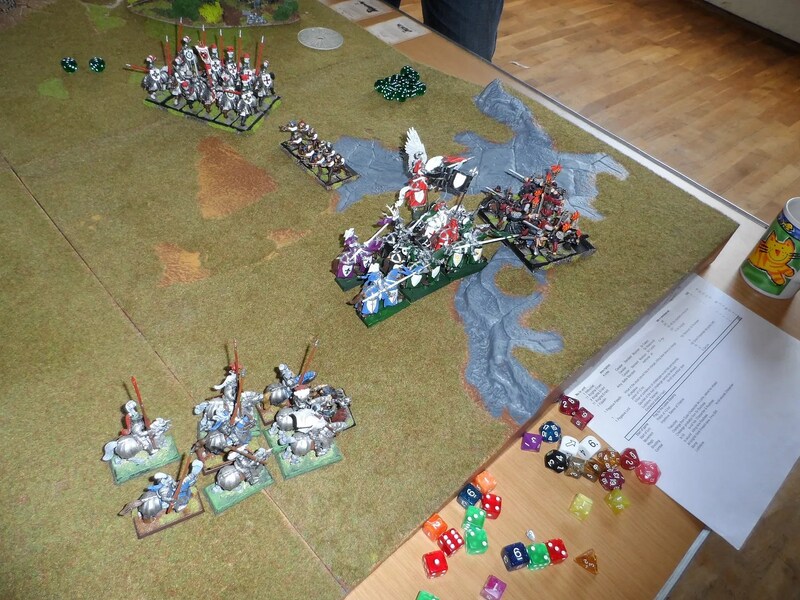 The Black Orcs won as they were simply better and outnumbered the swordsmen thus breaking my centre. 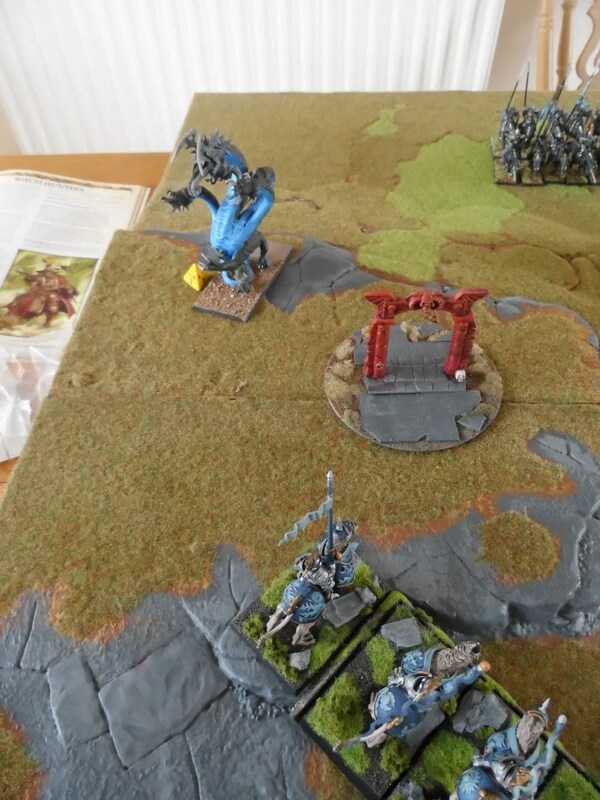 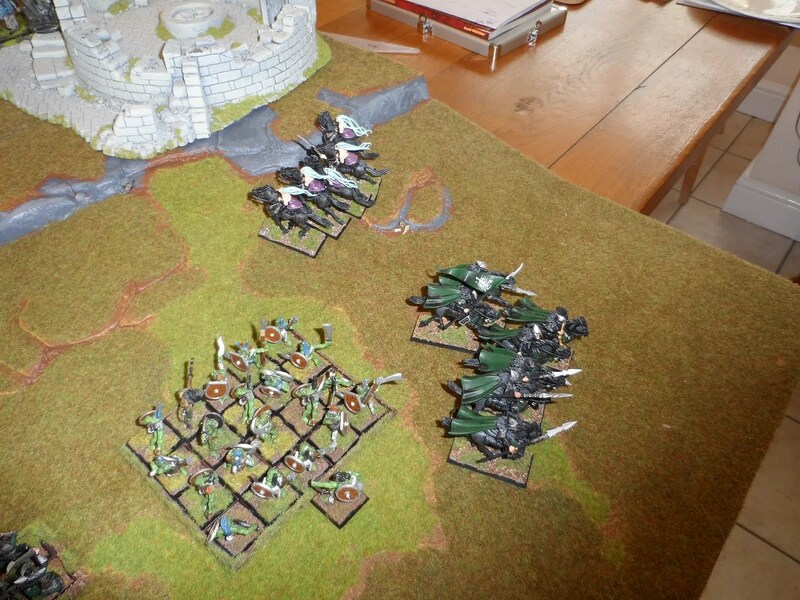 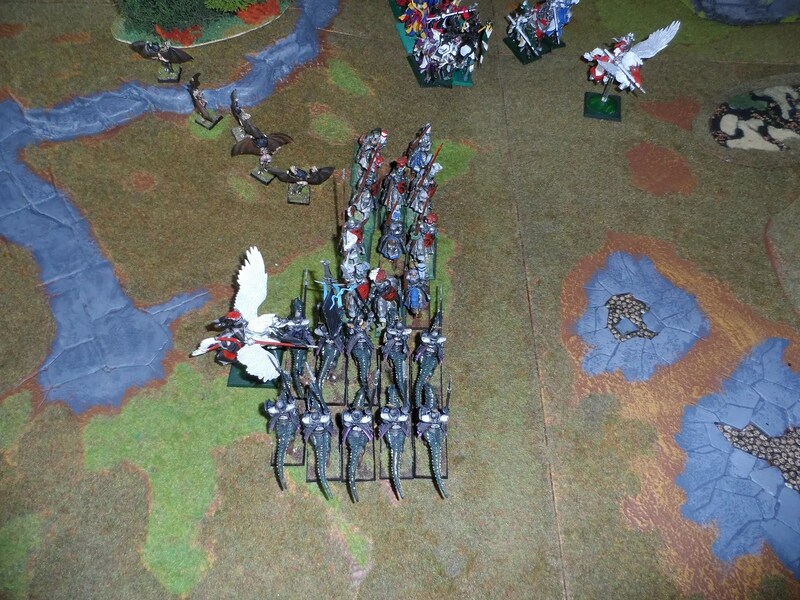 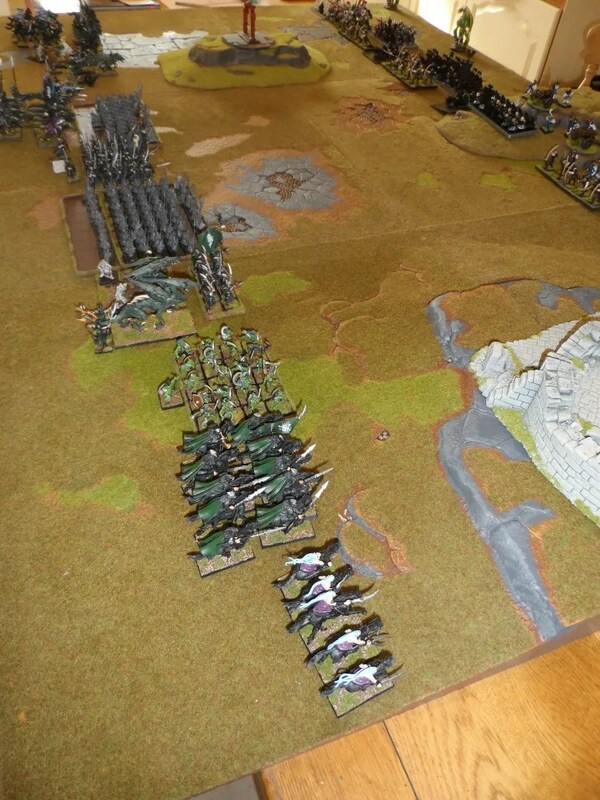 On my right flank things went better, seeing off the demi-gryph knights. 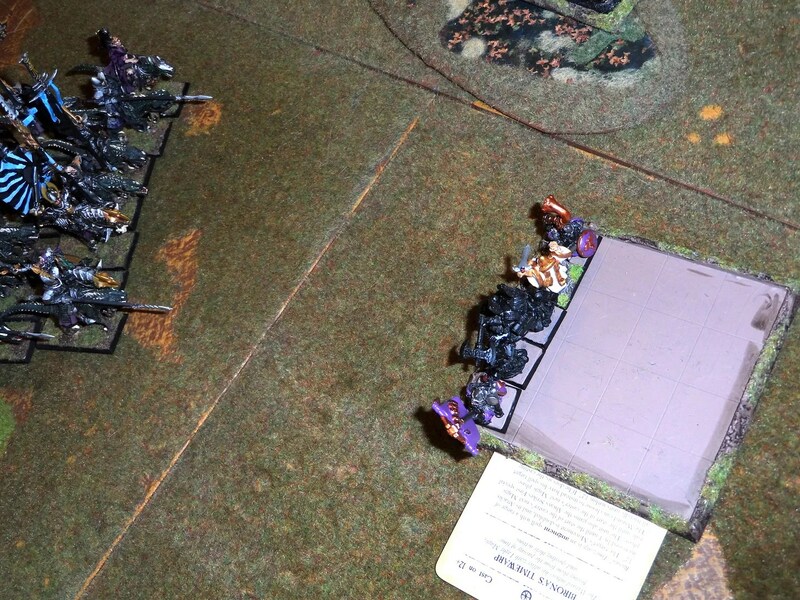 Overall it was not good. 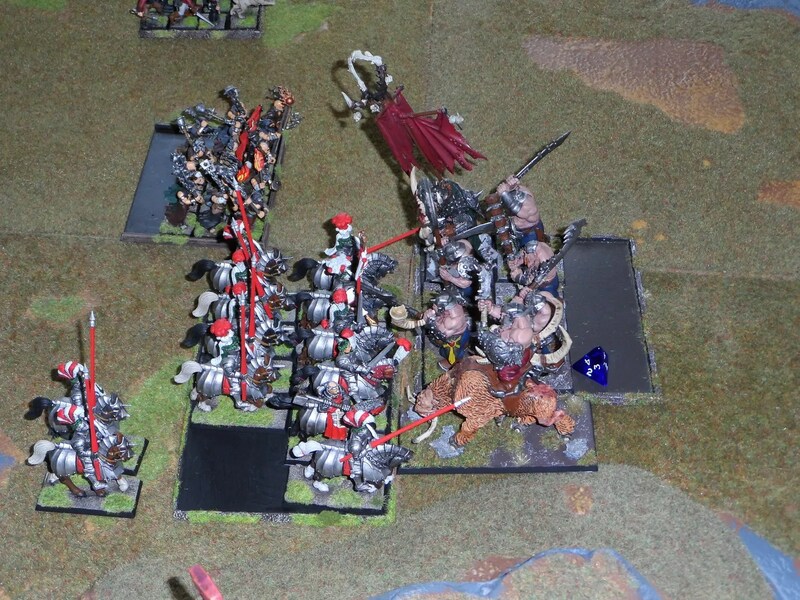 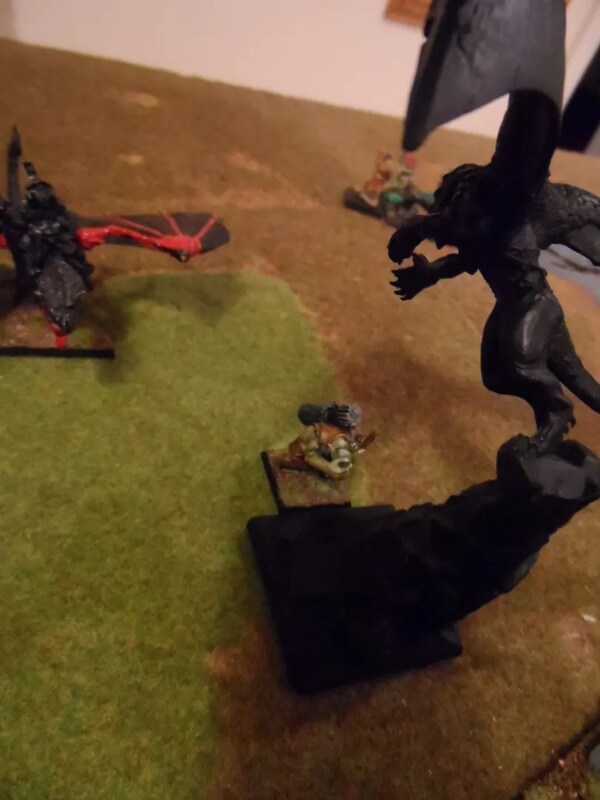 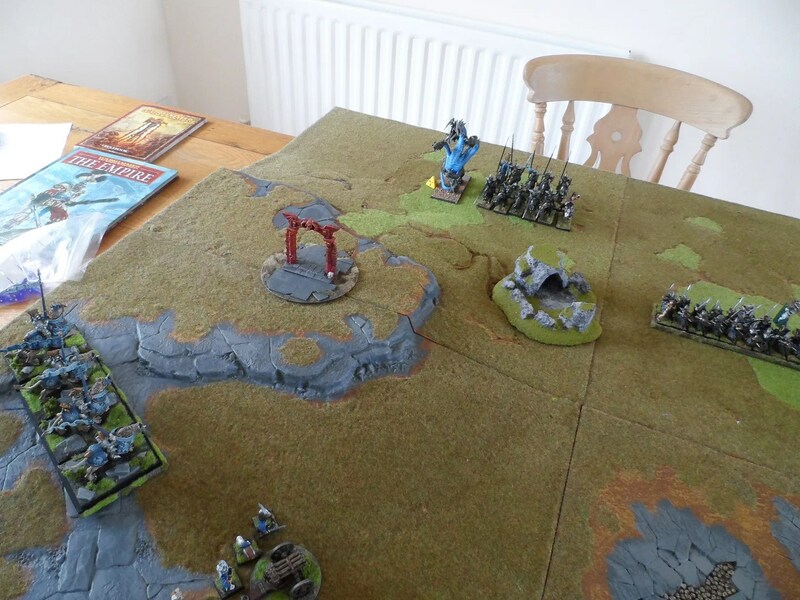 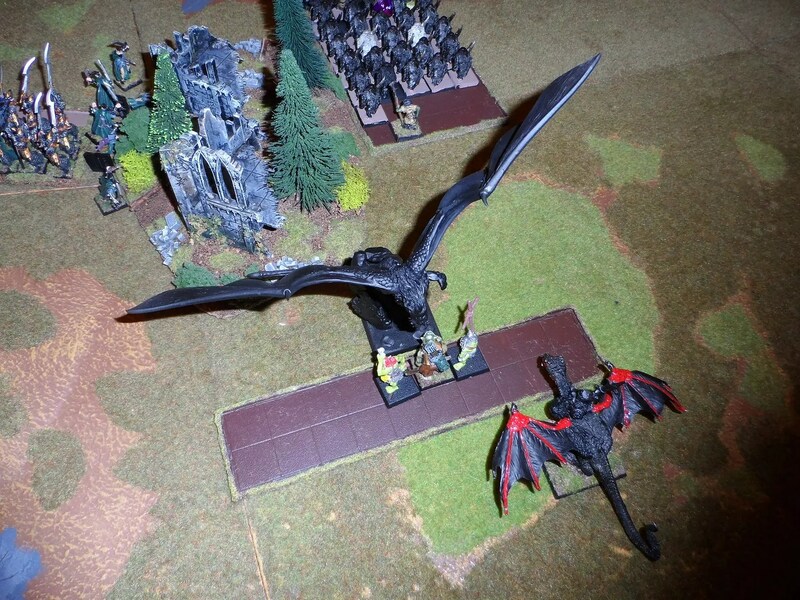 Bolt throwers had killed my Dreadlord atop the Manticore, but that didn’t stop the Manticore, who swooped in to deal with a unit of Orc arrer boyz, but didn’t kill them all, and due to the Orc General’s presence behind them didn’t even make them break ! 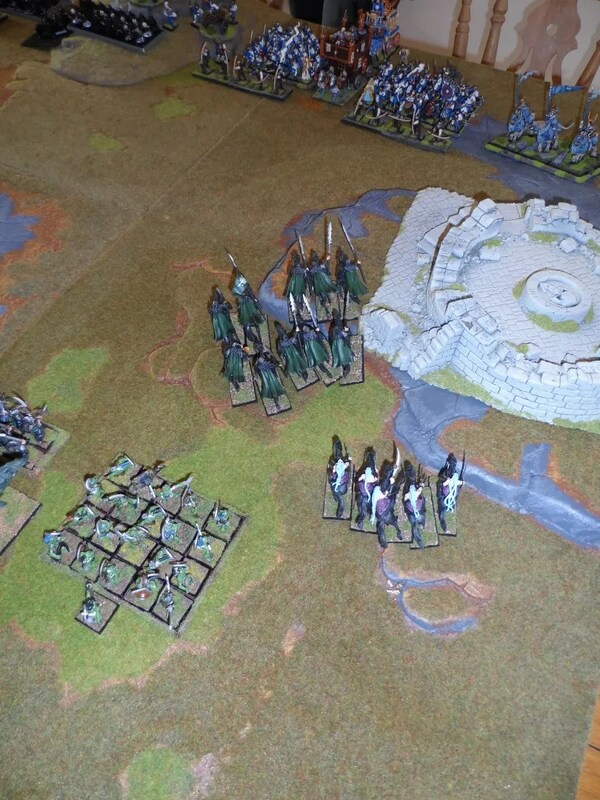 And ironically, the sole remaining Orc was painted by me as a present to Gav ! 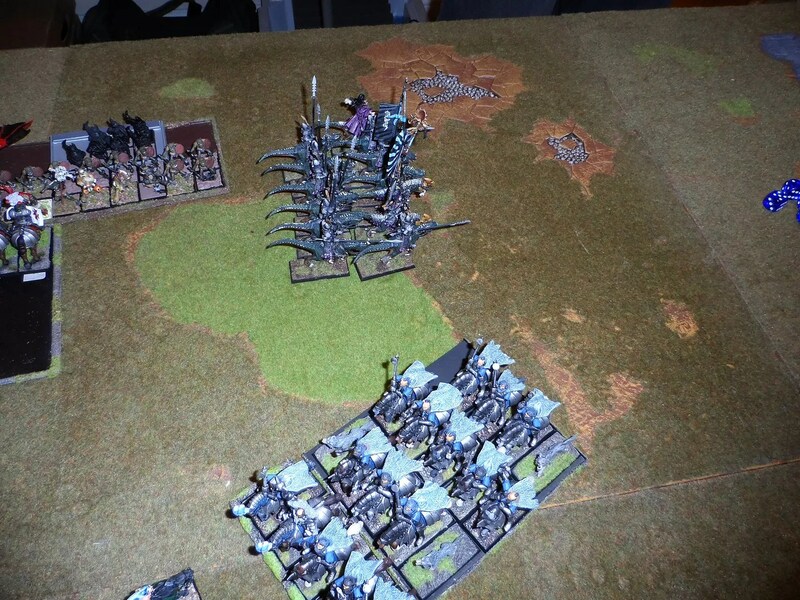 Executioners, execute the Orc bolt thrower crew having come off worse in shooting and magic rounds. 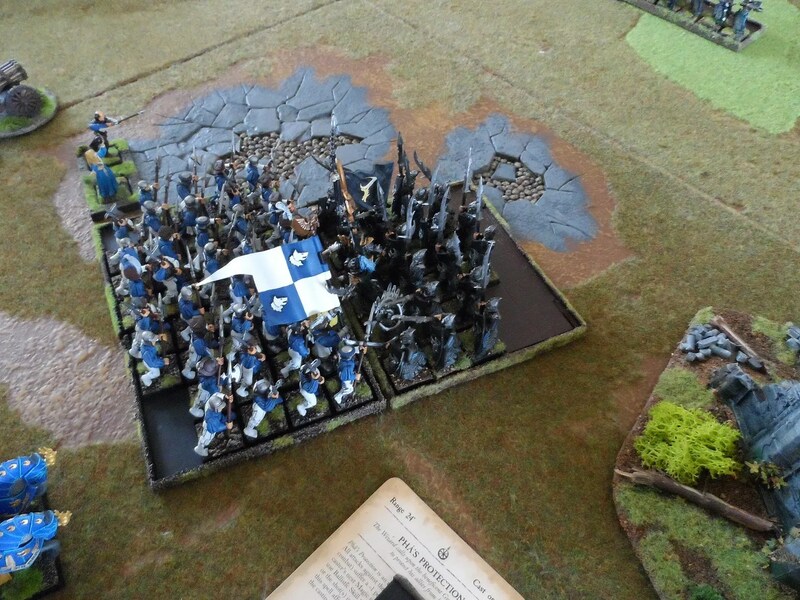 The Black Guard shore up the left flank seeing off the second unit of demi-gryphs. 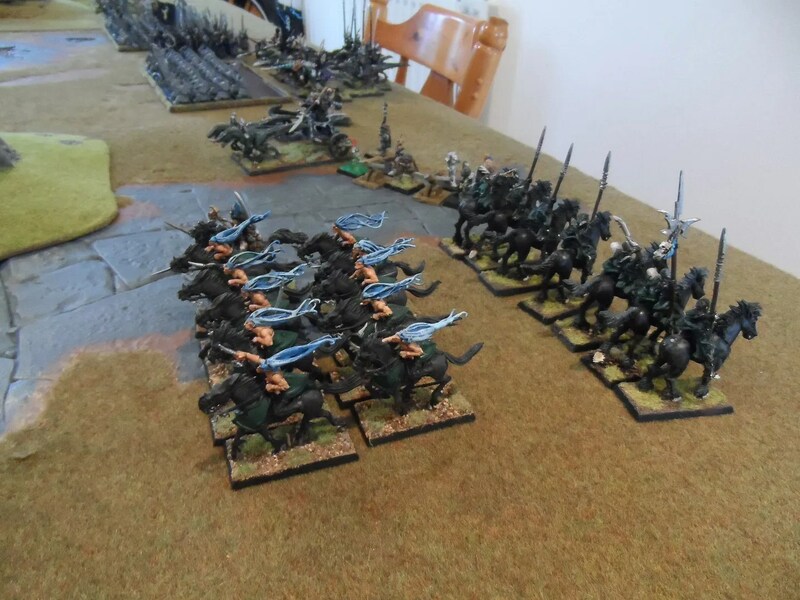 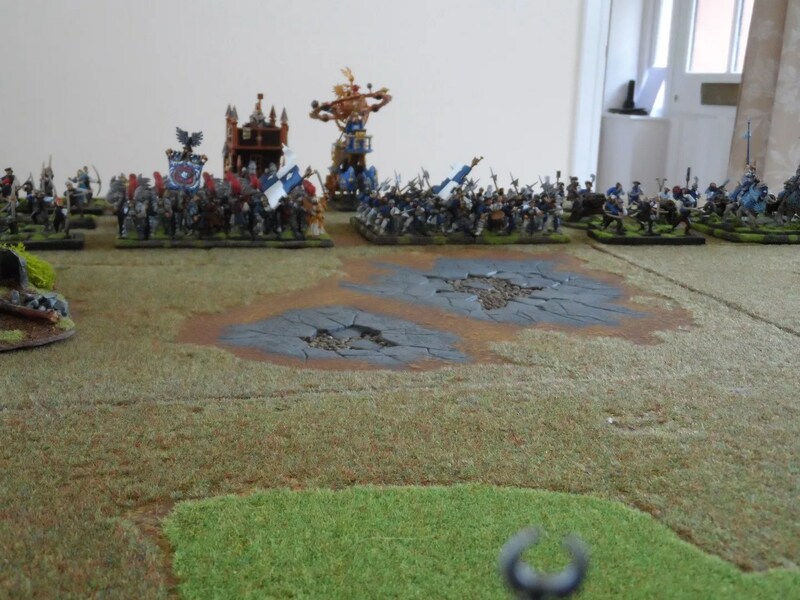 But even having turned the right flank, shored up the left, there was no way I had to break the centre held by the Black Orcs and the massed Empire ranks. 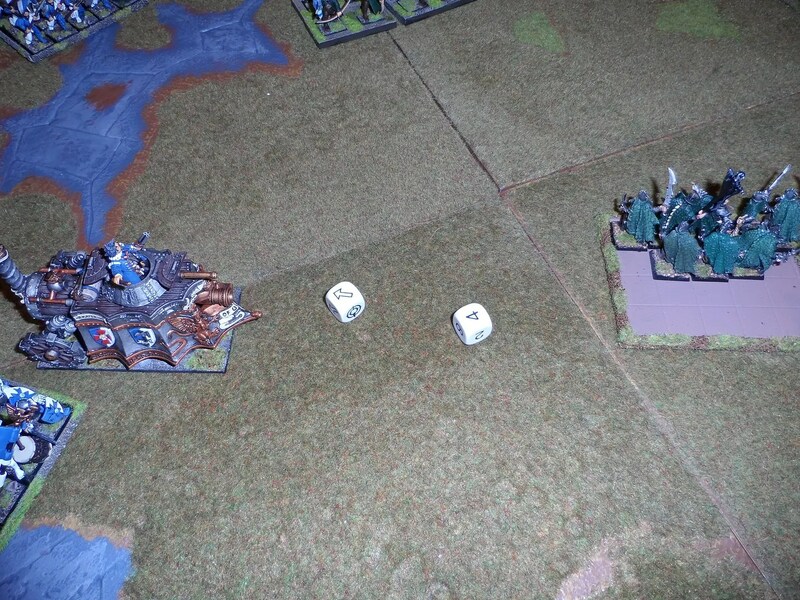 I took out a cannon but Rich’s artillery dice took out more. 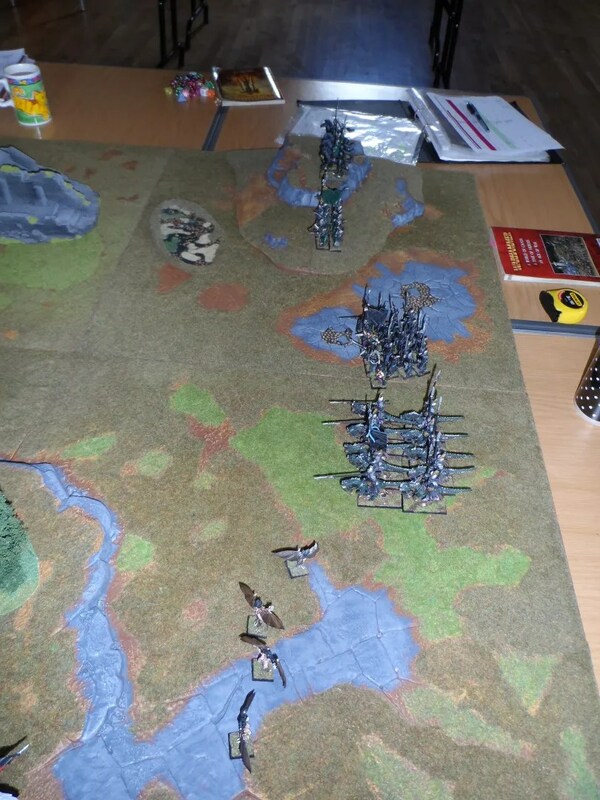 The two blocks attacked each other – the Empire won – just ! 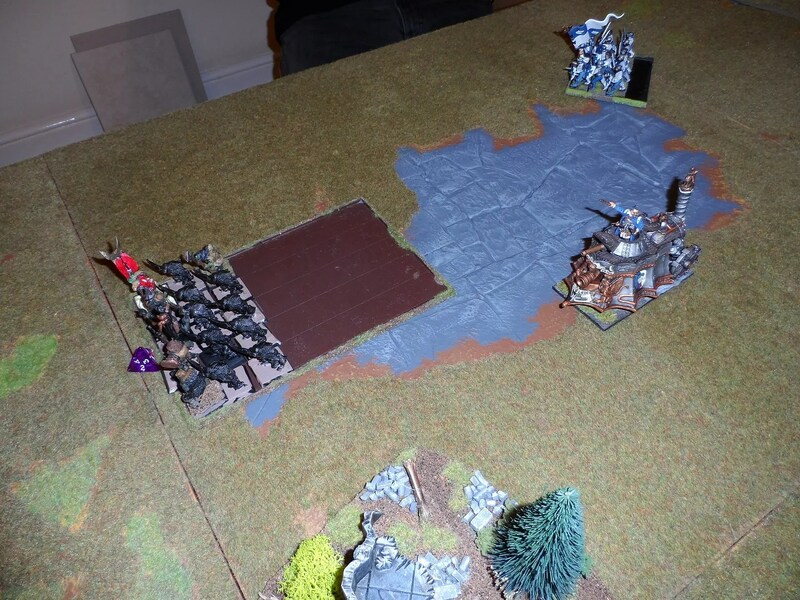 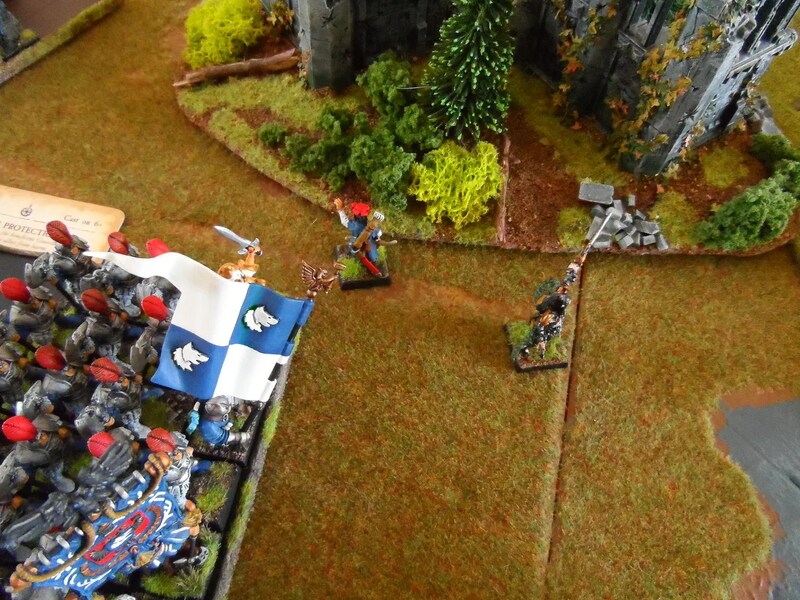 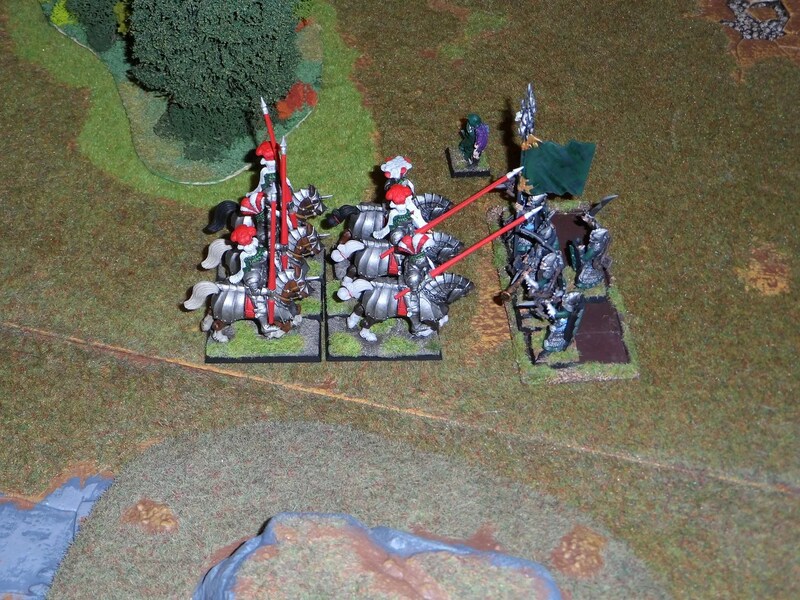 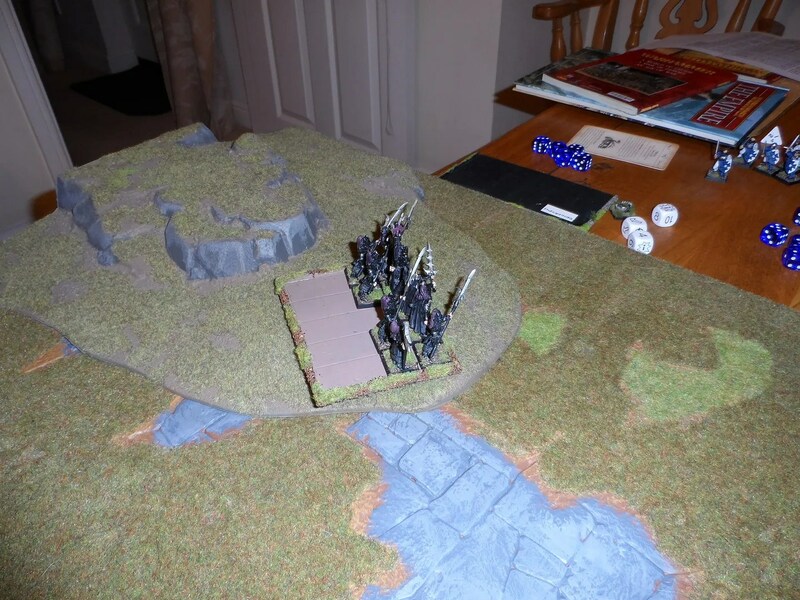 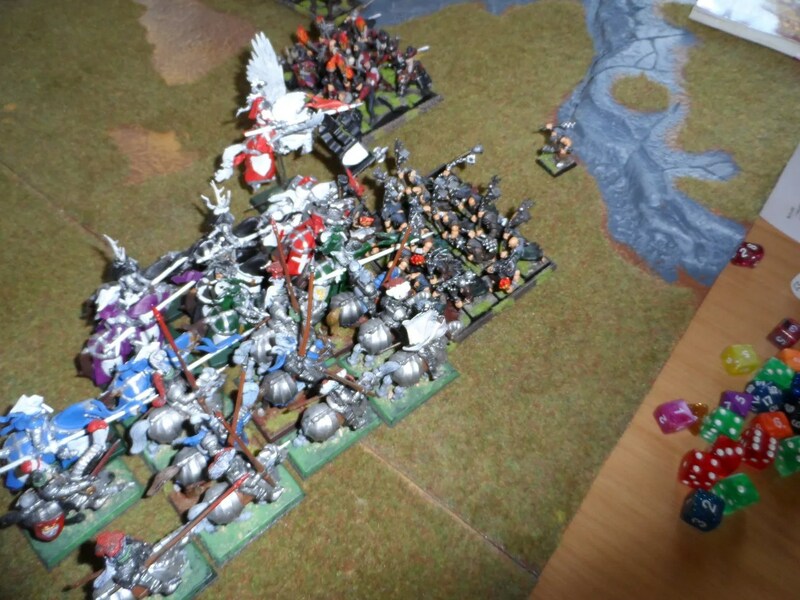 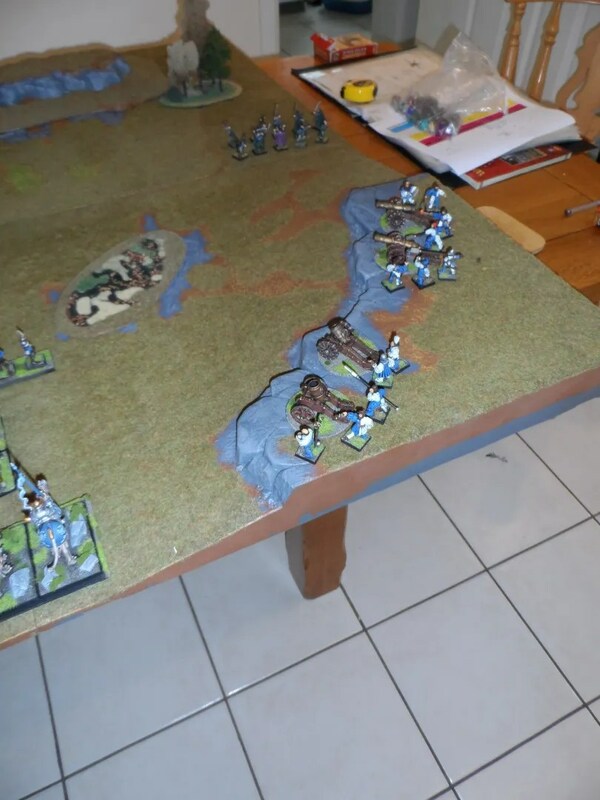 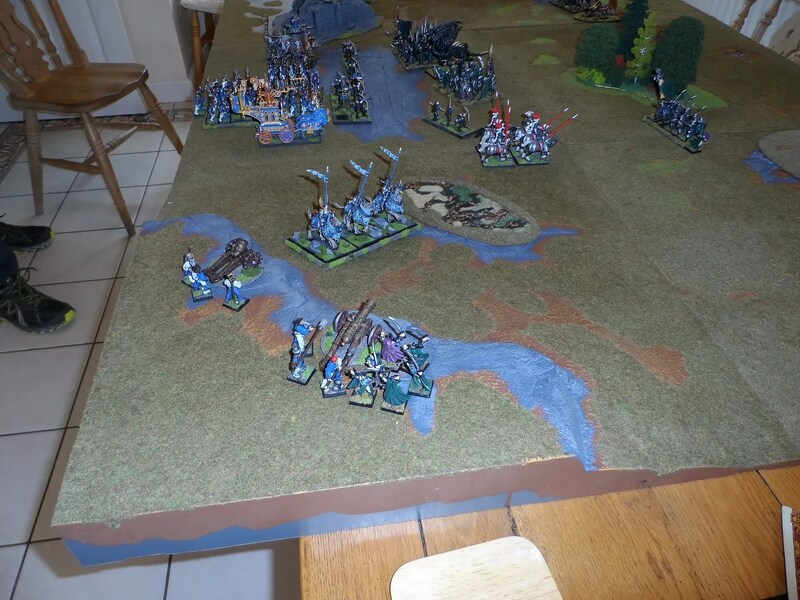 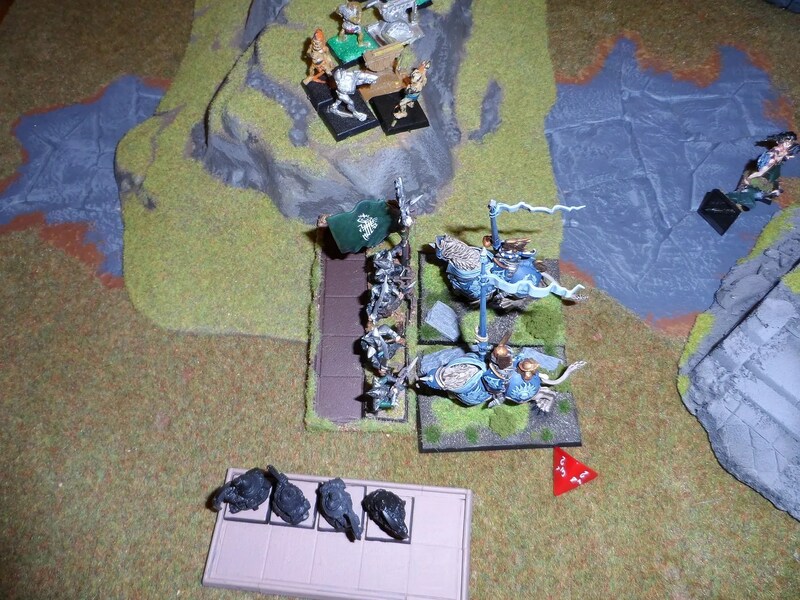 But they didn ‘t win easy – 10- RXBowmen made 6 knights bounce off them ! 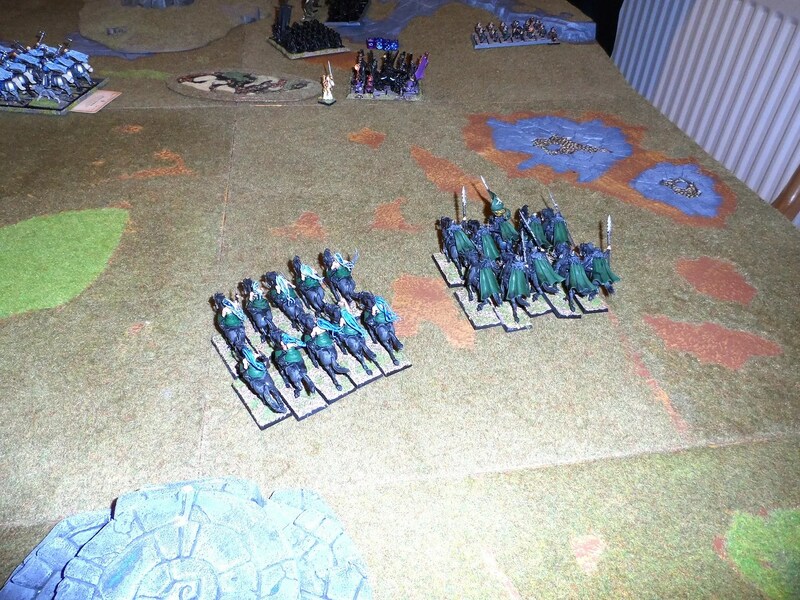 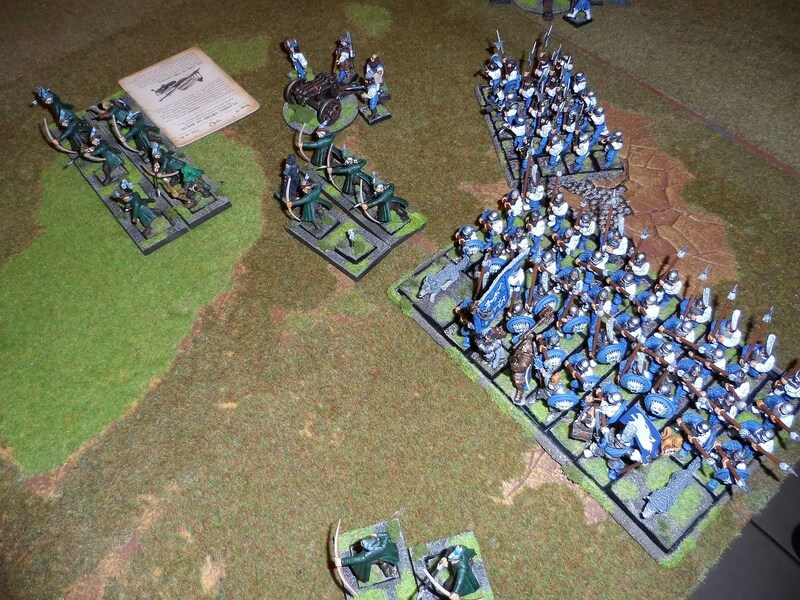 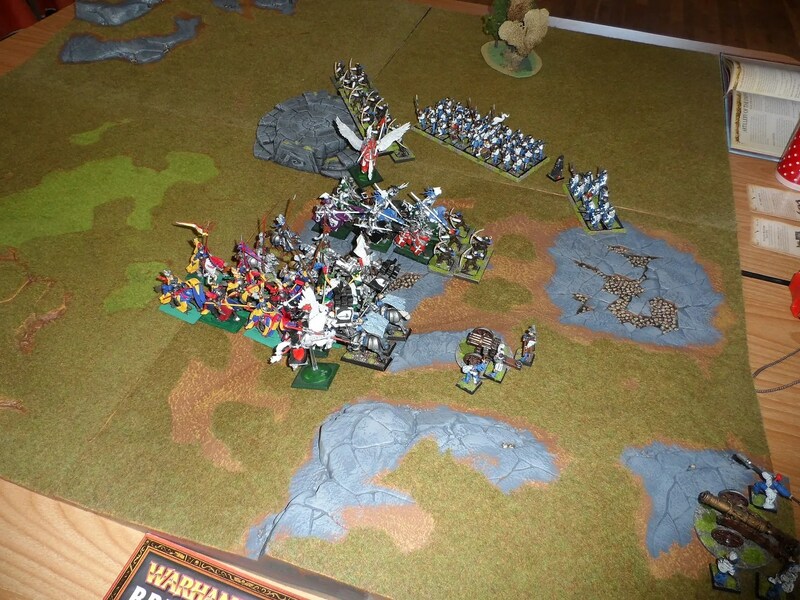 And the Silver Talon leader Samartik and only 5 spearmen fought off 50 Empire spearmen. 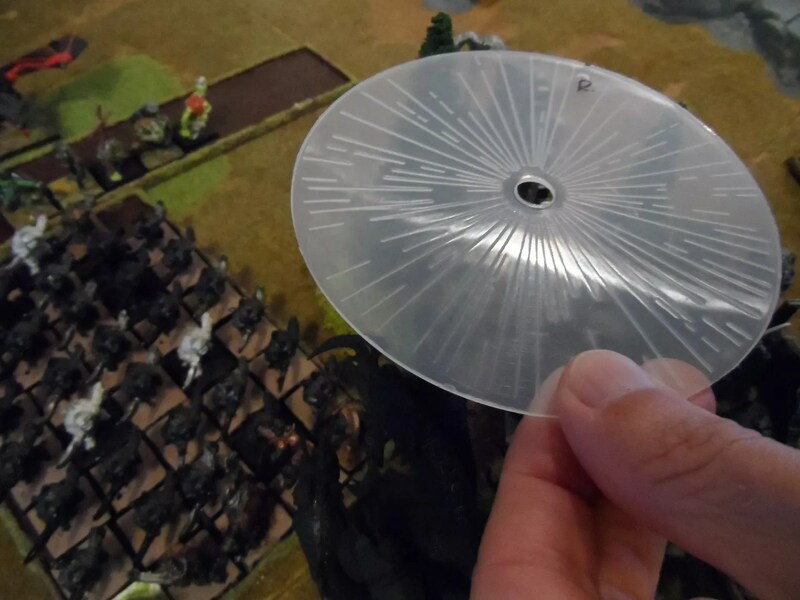 But it was only a matter of time. 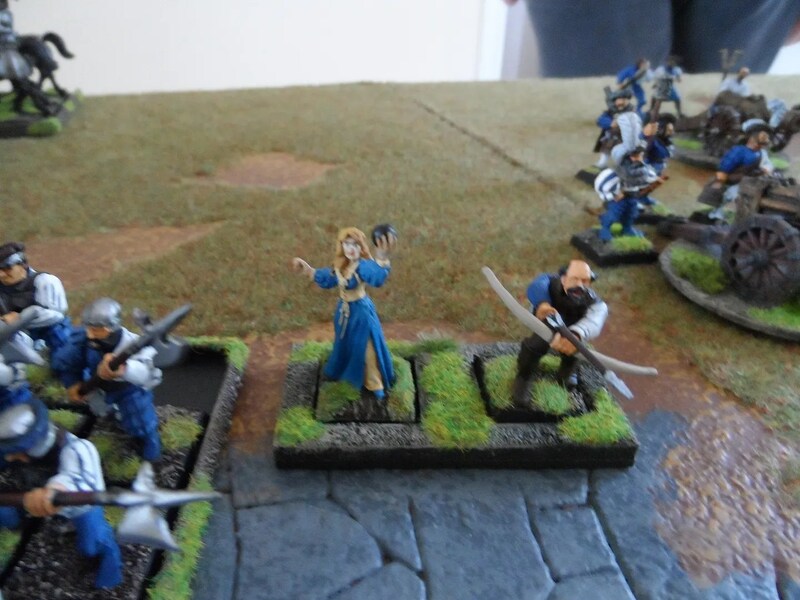 As usual the assassin came armed with as rubber swords. 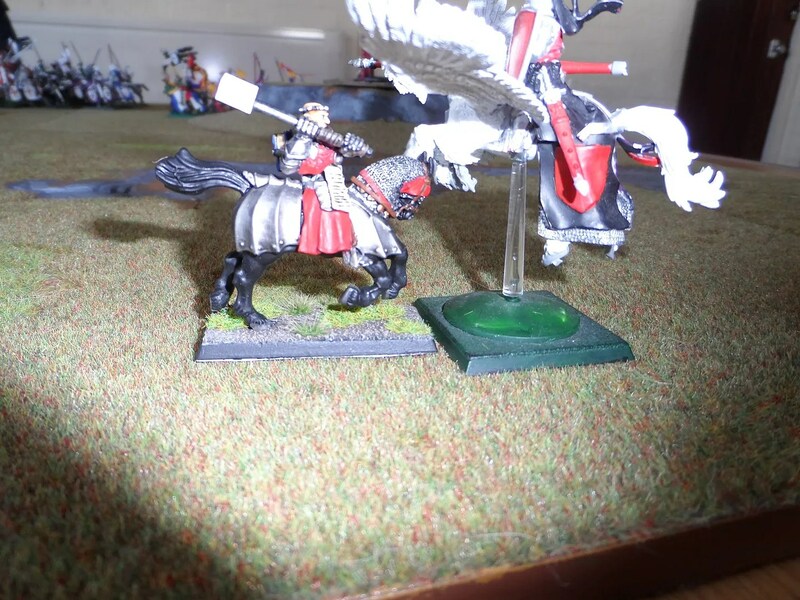 The Empire prevailed at a great cost. 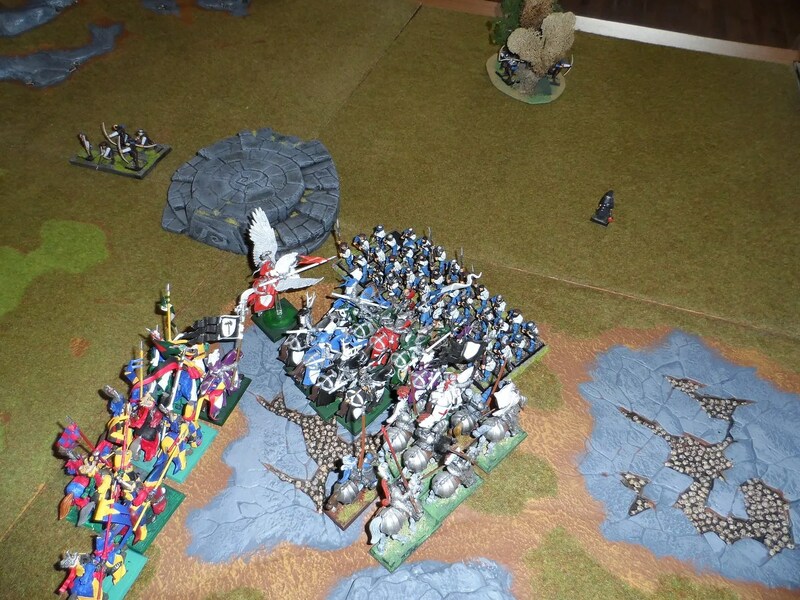 I had failed to get my Cold One Knights into combat which is where I failed. 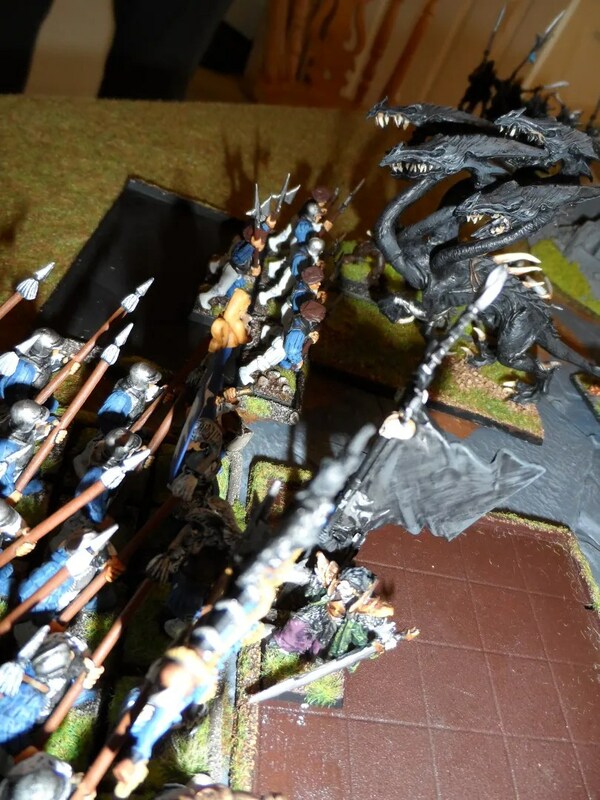 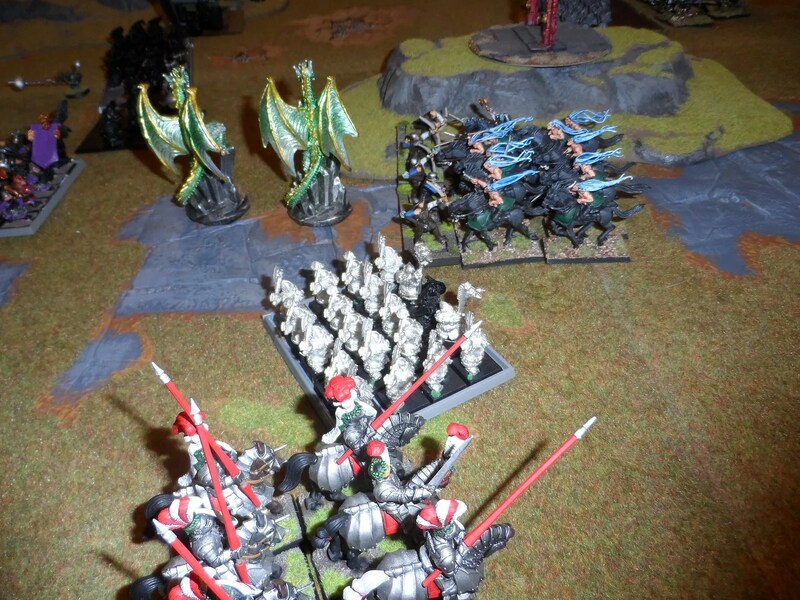 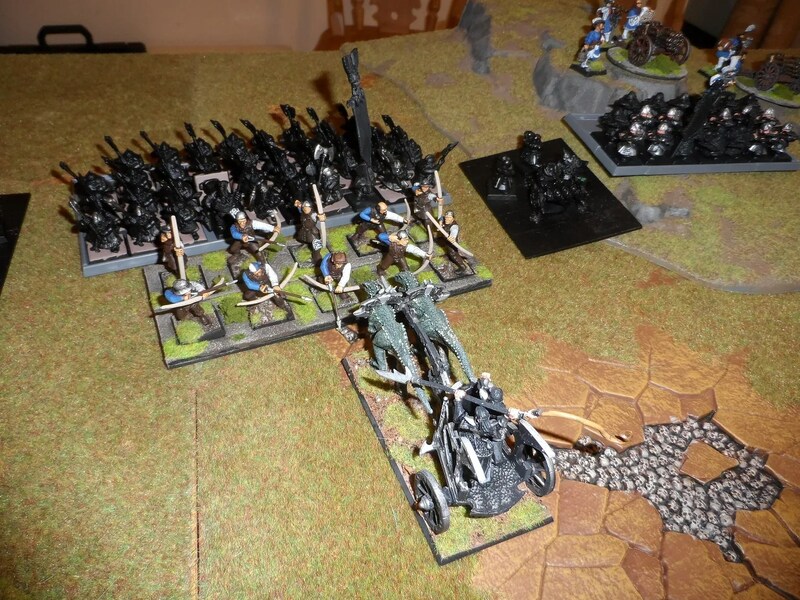 The War Hydra has got in and torn uP a lot of troops and 5 WOUNDS off the steam tank – not enough it seems.